Autofill and autocomplete are one of the best features Google Chrome provides. Once enabled, you don’t have to go through tedious text fields to type down the same information repeatedly. However, there are times, when you don’t want autofill to take over but somehow it does. Unfortunately, you end up refilling the entire form one by one. The problem becomes a headache when your machine isn’t secure and you’ve got your card details and SSN stored as auto-fill. Launch the Google Chrome on your machine. Scroll down at the bottom most of the page and click on “Advanced”. Under ‘Password and forms’, click on ‘Autofill settings’. Switch-off the autofill setting by clicking on the switch. Relaunch Google Chrome. (not necessary but recommended). 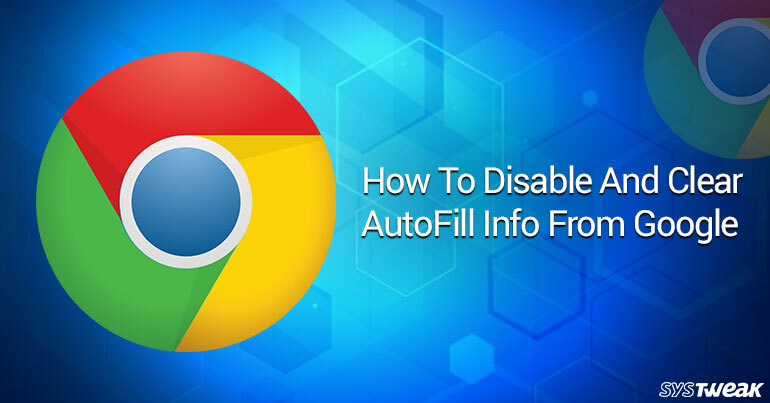 How to clear autofill data from Google Chrome? Click on ‘Clear browsing data’ under ‘Privacy and security’. Select ‘the beginning of time’ at the top, uncheck every other history that you don’t want to delete and check ‘Autofill form data’. Once you’re done with above steps, there are no more suggestions available while filling up a form. Though, you can make changes in your records and autofill data by applying almost the same steps. Its always recommended to disable and clear autofill info from Google Chrome on a public computer.